Récif Attitude is a quiet hotel on the north-west coast of Mauritius. Set on the white sandy beach of Pointe-aux-Piments and overlooking a marine conservation area, this 3-star Deluxe resort is only a 12-minute drive from the busy village of Grand Baie and 20 minutes from Port Louis, the capital. This hotel is reserved for adults only. The rooms have been carefully decorated in light colours to provide a cosy and peaceful ambiance and they all feature furnished terraces, which provide guests with either a magnificent view of the ocean or on the lush tropical garden. La Pointe-aux-Piments Restaurant hosts daily buffets for breakfast and serves a range of international dishes. 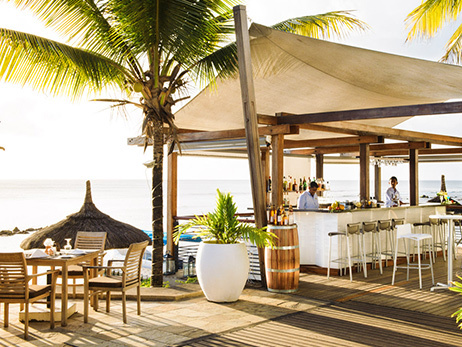 Closer to the beach, L’Océan Restaurant specialises in seafood while La Sirène Bar provides snacks and drinks from its ocean-facing deck. One of the highlights of Récif Attitude is its spa, which is an oasis of tranquillity with a hammam and massage treatments. Outdoor living areas invite guests to relax or take a dip in the pool. Diving, snorkelling and other water sports will attract the more active and adventurous ones. At sunset, guests are entertained by daily live music and a weekly sega show to discover the folkloric dance and music of the island. The approximately 25m² Standard rooms are decorated in shades of blue and beige, soft and relaxing colors. They all open up on a terrace or a balcony under a pergola covered with the tropical "passion fruit" creeper. The garden view Standard rooms are fitted with a double bed or twin beds, a bathroom with shower and separate toilets. The Deluxe Beachfront Room with 35m² overlooking the natural marine preserve, white walls, wood and wicker, warm colours these spacious rooms, are ideal for honeymooners or for those looking for a refined design. They offer a beautiful view on the lagoon. They all open up on a furnished terrace or a balcony covered by a canopy. Recently renovated, these Standard Rooms with 25m² are decorated in shades of blue and beige, soft and relaxing colours. They all open up on a terrace or a balcony under a pergola covered with the tropical "passion fruit" creeper. The garden view Standard rooms fitted with a double bed or twin beds, a bathroom with shower and separate toilets can accommodate 2 adults. It is also possible to accommodate 2 adults and 1 child (0-12 years old included) in 4 of the Standard rooms. There are 6 pairs of Standard communicating rooms, one with garden view and one with sea view. Situated almost right on the beach, La Pointe aux Piments Restaurant with its contemporary design, its comfortable wooden furniture, zen colors and new buffet area welcomes you for breakfast, lunch and dinner in a relaxed and friendly atmosphere. Opening Hours: breakfast - 07h30 to 10h00; a la carte lunch (Mauritian dishes, and picnic basket on request) - 12h00 to 15h00; and dinner (Buffets and “live-cooking”) - 19h30 to 22h00. Specialising in seafood, "a la carte," restaurant L'Océan and its breathtaking view on the ocean, offers you the experience of dining under the stars with your feet buried in the sand. Specialties: Fish and seafood, Crayfish and eggplant curry, and the calamari Mauritian sauce or the prawn rougaille (prior booking requested). This friendly bar opens up on a wooden deck nicely furnished. You can sip a selection of drinks and exotic cocktails while enjoying the magnificent sunsets over the Indian Ocean. Specialties: Mauritian snacks, and cocktails "Soleil Rouge" and "Pointe au Piments Spicy".